We found a new place to rent (about half the size and twice the cost of the place we’re leaving!). As I mentioned, we’ve been spoiled where we are (whole house to ourselves, big back yard, and low rent, which only went up $40 in ten years). One thing I wont miss when we move, however, is the neighborhood rats (I do like rats, but not as uninvited guests!). Scroll down to see the Year of the Rat art I finally finished. My novel The Truth About Rats (and Dogs) talks about rats and about Chinese New Year, so I couldn’t let the start of the Year of the Rat pass without blogging about the occassion. So, Gung Hay Fat Choy! (or Gong Xi Fa Cai!). People who were born under the sign of the rat (1924, 1936, 1948, 1960, 1972, 1984, 1996) are considered ambitious and hard-working – like their rodent counter-parts, who are diligent seekers of food. When rats sense food within reach, they will chew through almost anything to get to it. Similarly, when humans with this zodiac sign want something, they will as work as hard as a rat to achieve their goal. Apparently, 2008 will be a good year for rat people. Obstacles and setbacks can be overcome, and success is immanent (although it may be temporary). I’ve been taking an online art class (cool concept and a lot of fun) with artist Karyn Gartel, and I’m using some of the techniques in the first few class assignments to make some Year of the Rat art, which I’ll post here as soon as it’s done. 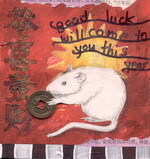 In the meantime, you can click here for last year’s Chinese New Year post and art or click here for a past rat post.